Rotary File for July 11, 2017 | Rotary Club of Iowa City A.M. 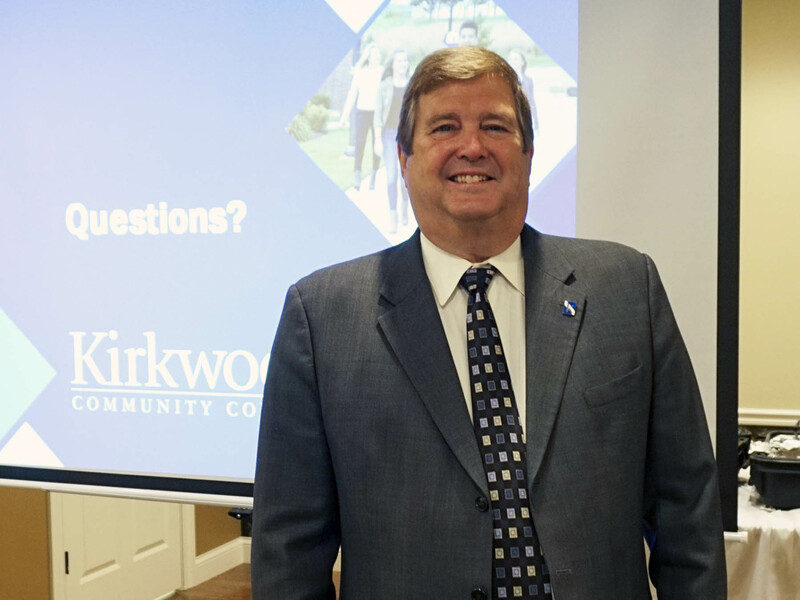 The speaker was Mick Starcevich, President of Kirkwood Community College, to talk about newer programs and advances at Kirkwood and the upcoming bond election. All is ready for the Year Ender to be held in place of a morning meeting at the UICCU building in North Liberty at 6:30 pm on June 27. If you have signed up to help set things up come early. Can sorting, with a fairly small haul of recycleables to sort, took place on July 10 with the help of the Ockenfels, Liz Loeb, Mike O'Leary, Phil and Beth Peterson, and the Knapps. Mark Patton, Brad Langguth, Jim Peterson and Ron Logsden helped to move some equipment and a used playhouse into the playground of the childcare center we hope to help through a District Grant in the new fiscal year. Thanks to Pam Ehly for greeting and to several who volunteered to help with KP duty. The month of July donations to the District Governor's World Bike Relief project will be matched. Get contributions to Deb Ockenfels, or send them directly to World Bike Relief, earmarked from AM Rotary/District 6000. The Food Fight has begun and the Downtown Club is breathing down our necks to win the most valuable award, the golden turkey, to bring in the most pounds of food. Remember that every dollar contributed equates to 4 lbs of food toward this challenge. There was a nice article about the Antelope Lending Library in the Cedar Rapids Gazette. Dave Parson's regular column in the Press Citizen came out this past week. At least 16 folks contributed happy bucks. Mick Starcevich highlighted a number of the newer things going on at Kirkwood and some of the impressive statistics that our area community college is racking up. Kirkwood touches almost 100,000 individuals per year. There are students from 99 countries, 34 states and every county in Iowa. Kirkwood has a great partnership going on with the University of Iowa to provide math and foreign language courses for UI students thus providing a savings to the UI budget. Kirkwood is recognized for innovation at each of its 14 locations. In 1966 the initial Kirkwood Board decided that no student should be more than 30 minutes from a community college education. Kirkwood has the number 1 agricultural program in the nation, to a large extent because the student/teacher ratio is 21/1. Kirkwood supplies over half the transfers coming into the University of Iowa and 2/3 of its students will transfer after completing their work at Kirkwood. Kirkwood has many unique, one of a kind programs that contribute substantially to the state's economy by almost $1B annually. Particularly unique is the Kirkwood Hotel. It is the only community college hotel out of 1200 community colleges. It is unique in having an authorized Apple store on campus and for having the only jazz radio station in the country on campus. The 417 ft wind turbine has become a big money generator for the state. Kirkwood has the only 2 cadaver labs in the state. It is unique in having a winery and an equestrian center on campus. Also unique are the dental tech lab and the Iowa sustainable village. Kirkwood is 4th in the nation in the number of students sent abroad. It has one of the largest scholarship programs in the nation. It has the top pass rate in the state for those taking the nursing certification exam. Last, but not least, the men's basketball team was national champ in 2016 and the women took their turn as champs in 2017. The bond issue is for $60 million to be held in September 2017. The tax rate of 25 cents per mil remains unchanged and will support the Facilities Master Plan developed in 2016-17. Essentially, all this bond issue does is add 5 more years to the present debt. The tax rate will not go up; it should come down over time. The bond issue will allow adding a student center and ampitheatre for outside study and programs. It will allow activities that take place in several different locations, such as registration, to take place in one location. There will also be a new addition to the Iowa City campus of a 24,000 sq ft building for expanded continuing education, ESL and other programs. There is also an addition planned for the agricultural building, Washington Hall, to support this growing program. There is a small addition to the recreation center, and also some much needed added space for Auto Tech.